Outdoor nets for the seniors have have started on Tuesday evenings. Paul Jackson has certainly not been idle over the winter and he says both playing squares and outfields are looking good for the new season. Pre-season friendly fixtures will take place this weekend. On Saturday, April 13 with 1pm starts, the 1st entertain Beverley Town and on the second square the 3rds host Cramlington. On Sunday 14 at 1pm the 2nds host South Shields . Spectators and potential new players are welcome to come along. First team skipper Ben Debnam 07595 298 196 can be contacted for more information. 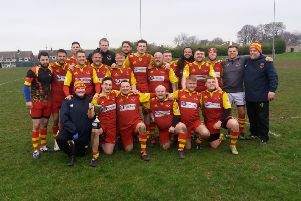 The 2nds won Division 2 for the first time and were 32 points clear of South Northumberland, pushed in to second place. Captain Andrew Davison can be especially proud when he receives the cup on November 9. Washington CC were defeated in the finals of both the James Bell Cup and the Roseworth Trophy as Tynemouth completed a hat-trick of successes. Top performer with the bat was Niall Piper with 839 runs, supported by Chris Fairley, Andrew Lineham, Graeme Hallam, Josh Koen and Andrew Davison.